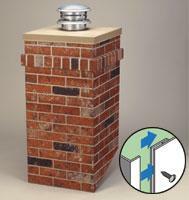 The R-CO Chimney Surround is virtually impossible to tell from a brick and mortar chimney. Its installation transforms plain ol' looking class-A-chimney (or other pipe) sticking up through the roof into the look of a real brick and mortar chimney. R-CO Chimney Surround is constructed of coated, 22ga. steel with interlocking joints so installation is a snap. PLEASE NOTE MORE DETAILS ON PRODUCTS. SOME ARE REQUIRED TO GO FREIGHT. UP TO AN ADDITIONAL $100 MAY HAVE TO BE CHARGED.